I just returned from the 2015 International Ski for Light event in Granby Colorado. It was an amazing week of cross-country skiing under big, blue skies in the Rocky Mountains. We enjoyed well-groomed trails, sunny days, beautiful snow, and crisp mountain air. The best part though was connecting with a group of inspiring people. Ski for Light is a non-profit organization run by all volunteers, which enables visually impaired and mobility impaired individuals to enjoy a week of skiing with a personal guide. There were 100 dis-Abled skiers, 100 sighted guides and a host of other volunteers who make the week go smoothly. 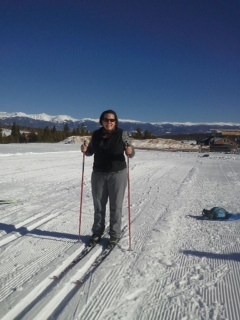 I am so thrilled to have had this opportunity to learn to ski for the first time in my life. I had no idea whether I would be able to do it but as it turns out, I can…even at my age and with the little bit of vision I have left! It was a memorable week which taught me I can do more than I think I can. I learned about the program from a friend who is also keen on new adventures. She has been attending Ski for Light for many years. In my retirement, I am determined to try new things, learn new skills and get fit. So this opportunity was exciting and I did not hesitate to sign up. It spurred me on to join the gym and exercise regularly so I would not embarrass myself. I arrived in fairly good shape, though there is always room for improvement. 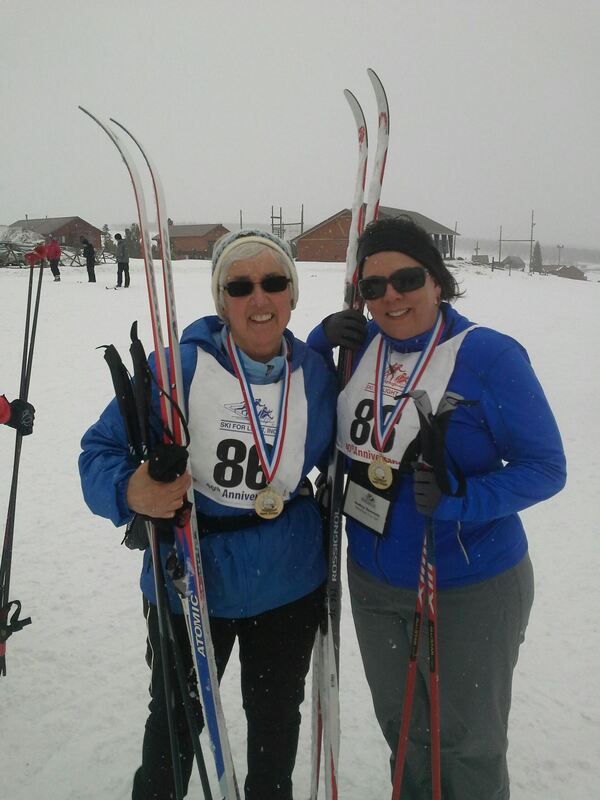 I worked hard at learning the basics of cross-country skiing with my experienced guide/instructor Lynn Cox. She has been coming to SFL for many years, volunteering her time and at her own expense, to guide and teach visually impaired skiers. The guides are trained to work with the visually impaired and most are accomplished skiers who can share their expertise. We are treated with respect, dignity, and full inclusion and it is easy to forget you are visually impaired while at SFL. And that is a wonderful thing! Well, as it turns out, I have a special talent for falling safely and popping up quickly which I demonstrated over and over. This is an important skill, but it was not the one at which I wanted to excel. All week, I tried to fall less and ski more smoothly. I set goals for myself and worked to do my personal best each day. In the end, I improved every day; skiing farther, faster, and with fewer falls with the support and encouragement from Lynn at my side. That is what it is all about; learning your limits and then pushing past them! I have a lot more to learn and hope to master that darn “snow plow” next year. Lynn and I after completing the 5k Rally-note the beautiful medals! Ski for Light does a fantastic job of not only accommodating all levels of disabilities, but also all levels of skiing ability from the first timer to the serious race competitor. The guides are carefully matched with a skier in order to achieve the skier’s goals for the week. The program offers special interest workshops, evening entertainment and lots of opportunities to make new friends. The cost is subsidized by generous donor funds and scholarships are available for first-timers. I heard many inspiring stories and witnessed something special at SFL this week. Harald Vik is 72 years old, deaf-blind and from Norway. He has been coming to SFL for years. Last year he was hit by a car while riding in a tandem bike event and sustained many broken bones. He was determined to be at this year’s event even if he had to use a sit-ski (for the mobility impaired skier). I met him out on the trails making his way on his own two legs after months of rehab and therapy. I call him “Amazing Harald.” And one bright day on the trails, I was passed up by a 93 year old gentleman who is totally blind and has been coming to SFL for more than 20 years. Way to stay young and active, Charlie! Yes, the dis-Abled skiers were inspiring to me…but so were the dedicated guides and volunteers who come back year after year with such a heart of service and passion for this excellent program. Harald Vik and his interpreters from Norway. Is Ski for Light For YOU? Are you looking for a new adventure? Do you like to be active and learn new skills? Ski for Light may just be the thing for you! Learn more at www.sfl.org I will be there next year, will you? Have You Heard About NVDA and Computers For the Blind? I have been surviving on the computer with Zoomtext for the last 12 years. It has been wonderful to have such access. I actually started with “Bigshot”, a precursor to Zoomtext, and it allowed me to continue my job for years. But alas, my vision continues to change and technology changes even faster! I now have cataracts that affect the last bit of vision I have to read. I am making plans to have them removed and hoping to clear up my central vision. But at the same time, I have been thinking about making the transition to using a screen reader rather than a screen magnifier program so I can continue to use a computer. I understand that the JAWS screen reader is difficult to learn and quite expensive. I am intimidated by it and dread learning it! Then there is Windows Eyes which I hear has some issues and seems to have less tech support available. In some cases, the state Vocational Rehab agencies will purchase access software and provide training for users. But in my state, there is a 2-3 year wait for these services. Many blind and visually impaired people cannot afford these expensive products on their own and it is sad how companies seem to exploit the disabled. So many blind and visually impaired people do not have access to a computer, social media, on-line shopping and the wealth of internet information. Through this work, Michael and James have gained extensive expertise in software accessibility. They have also fostered relationships with companies such as Mozilla, Microsoft, IBM, Adobe and Yahoo! and have contributed to the accessibility of their respective products. NV Access is based in South East Queensland, Australia. And did you know about Computers for the Blind? It is a program that refurbishes desktop and laptop computers and then makes them available to people who are visually challenged for a nominal fee. The computers come preloaded with either magnification software or NVDA screen readers, monitors, keyboards and more. The mission of Computers for the Blind (CFTB) is to open the world of information technology to persons who are blind or visually impaired by providing computer equipment, software and training. Check out their site at: http://www.computersfortheblind.net/index-2.html or call 214.340.6328 to learn more. The Hens are made up of five visually impaired women and five sighted guides who have been friends for years. They are the kind of women who are “shakers and movers,” impressive in their vivacious spirits and thirst for adventure. 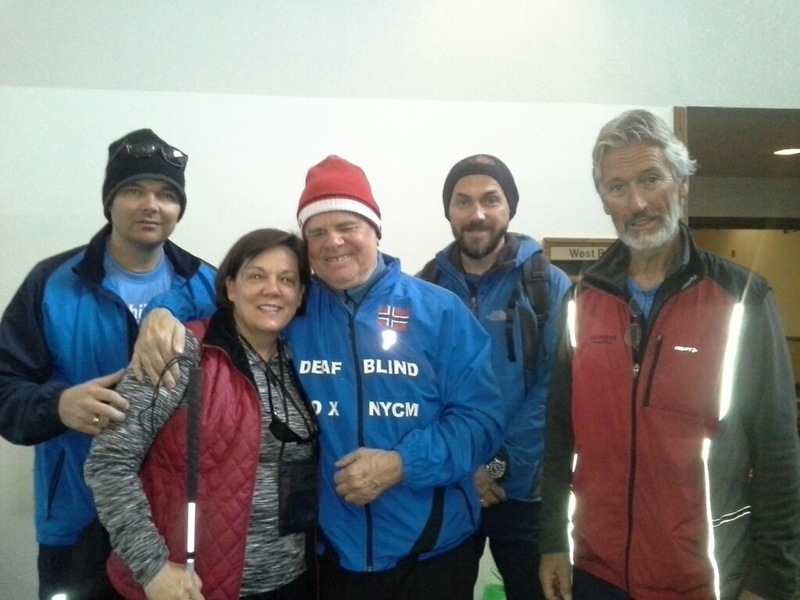 Most of them have been involved with Ski For Light, Inc. (which I will write about in another post), where the sighted guides have developed their skill to guide the visually impaired and their selfless sense of service as volunteers. 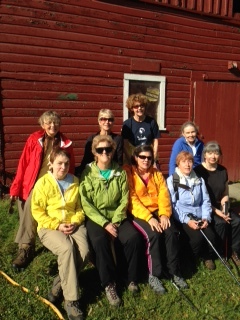 It is a group of physically fit and “aging gracefully” women who know how to have fun! They are world travelers, survivors of some of life’s most difficult challenges, professionals, wise, well-read, kind and gracious ladies. And it was such a privilege to be among them! We stayed at the Starlight Inn in northeast Pennsylvania. It is nestled in the country, overlooking a lake and surrounded by scenic trails. Sari the innkeeper, runs the quaint establishment with other family members. Wholesome and homemade meals are served in the cozy dining room where you feel as though you are part of the family. Every day, we were sent off on our hike with made-to-order sack lunches; meaty sandwiches on freshly baked bread, crisp apples and homemade cookies. Each morning we hit the trails paired up with our guide for the day. 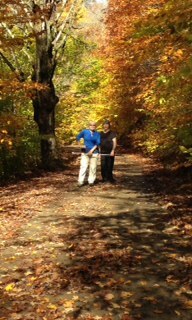 The trees were spectacular in their fall “coats of many colors.” We walked the woodsy paths, side by side, at an easy pace and lost ourselves in companionable conversations. Breathing in the cool fresh air, we merrily trudged along in our broken-in boots,LLBean flannels and brandishing our walking canes. The sun was bright on our faces as we wandered the forest, leaving behind the worries of the world. The hikes were pleasant and we covered quite a bit of ground. We discovered several waterfalls and open meadows which were perfect lunch spots. 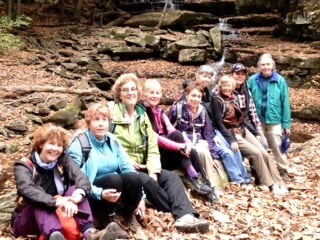 It was refreshing and relaxing to enjoy the beautiful scenery with new friends who also appreciated nature. The hiking was only half the fun. Every day, we gathered in the “parlor” for Happy Hour, sipping wine and nibbling cheese and crackers. We shared stories of our lives and talked about the day’s highlights. Each day, I learned more about the Hens and grew to appreciate their colorful personalities, their vitality, and their fun-loving, adventurous spirits. After our lovely evening meals, we retired to the sun porch to play games. Some of the Hens pulled out their knitting as we played. We cackled and laughed until we cried and our sides hurt! And after much mirth and merriment, we trotted off to bed, full and satisfied with the day’s activities. This trip was such a joy. Everything went smoothly and the group meshed so well. I am grateful to these special women for welcoming me warmly and sharing their lives with me. 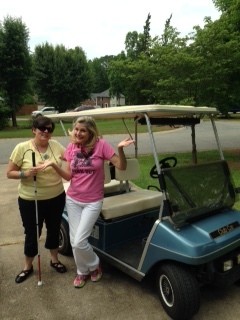 I appreciated what the guides did for us VIPs (visually impaired person) and I was inspired by the VIPs. It is always reassuring to me to be with others who are visually impaired and managing life so well…it empowers me to keep on and encourages me to “see the possibilities” for new adventures. Happy Trails! My guide dog turned 5 years old yesterday. All day I pondered the ways she enriches my life and facilitates my independence. I celebrated her with extra hugs and special attentions and she ate it up. I even fixed her a “birthday” treat which my sister shared with me. (Take several doggie treats and place them in a small bowl. Cover with water or chicken broth and freeze. Pop it out of the bowl and give to your dog) Sophie loved her popsicle and worked on it out in the yard. 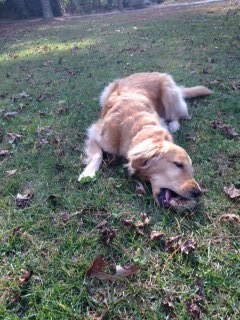 She also got a juicy bone to chew today! 10. My Leader Dog helps me to live a healthy walking lifestyle. 9. With my Leader Dog, I am more engaged in my community with organizations like Lions Clubs and local school groups. 8. My Leader Dog helps break the ice and start conversations socially. 7. I feel confident and eager to go places with my Leader Dog. 6. My Leader Dog gets me from here to there with style, grace, and efficiency. 5. My Leader Dog keeps me on a schedule and encourages me to play. 4. My Leader dog helps me walk in a straight line, maintaining my balance, pace, and route. 3.My Leader Dog assists me to stay safe while walking, avoiding obstacles like curbs, signs, and people. 2.With my Leader Dog, I am able to walk with my head up and enjoy my surroundings. …and the #1 way my guide dog assists me is she provides unlimited love, adoration and devotion which lifts my spirit and enriches my life…what is not great about being adored?! Happy Birthday Sophie…I love you to the moon and back!